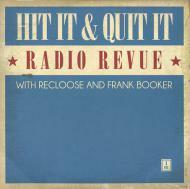 Hit It & Quit It was founded by Detroit-native Recloose, & is now co-hosted by DJ/producer extraordinaire Frank Booker. The show airs every Monday 6-8pm on George 96.6FM & has quickly become one of the station's top rating shows. Hit It & Quit It features special guests, themed shows, artist features, interviews & guest mixes, all delivered in an irreverent but knowledgeable & passionate style. Radio Revue vol. 1 is a showcase for the Hit It & Quit It musical philosophy.